A master's degree in information technology prepares graduates for management positions and advanced roles in tech, business, and other sectors. With a master's degree, IT professionals work in high demand areas that offer lucrative salary opportunities. For instance, computer and information systems managers earn a median annual salary of nearly $140,000. According to the Bureau of Labor Statistics, the computer and information technology sector will add over 550,000 new jobs by 2026, making it one of the fastest-growing sectors. In the expanding, high-income field of information technology, earning a master's degree helps professionals advance their careers. In a competitive job market, candidates with a master's degree stand out. Earning a master's degree also lets IT professionals apply for positions like IT manager or computer and information research scientist. During an online IT master's degree, graduate students expand their skills in cybersecurity, data analytics, and information management. The degree helps professionals advance their careers and qualify for in-demand certifications. This article talks about the best IT master's programs, career and salary opportunities for professionals with a master's in IT, and the best certifications for IT managers. What is a Master's in Information Technology Degree? Online Master's in Information Technology Degree Program Ranking Guidelines: We selected the programs based on the quality of the program; the types of courses offered; and the faculty, rankings, awards, and reputation of the school -- including the school's reputation for effectively providing online programs. Founded in 1831, New York University features a historical campus in Greenwich Village, New York City. A private research university, NYU offers a variety of programs to both undergraduate and graduate students. The master of science in management and systems provides students with solid business leadership skills and in-depth knowledge of information technologies. Students can complete the program completely online, in a traditional classroom setting, or in a hybrid format (combining online courses with in-person requirements). Students pursuing their online master's degree in information technology at NYU can further specialize their program by choosing a concentration from one of the following options: enterprise risk management, database technologies, systems management, or strategy and leadership. To graduate from the program, students must complete core curriculum covering topics including strategic marketing, managing in a global economy, and information technology and data analytics. Additionally, students complete four courses from their chosen concentration, an elective, and a capstone. Requirements for applicants to the management and systems program include a bachelor's degree from an accredited college or university, a personal statement, current resume, GRE or GMAT scores, two letters of recommendation, minimum 3.0 GPA, and transcripts. Graduates of the program benefit from affiliation with top companies including Time Warner Cable Inc., GE Healthcare, McKinsey & Company, and WilmerHale. NYU is regionally accredited from the Middle State Commission on Higher Education (MSCHE). Recognized as one of the top private research and teaching universities, Northwestern University is located in Evanston, Illinois; it also harbors two additional campuses in Chicago and Doha, Qatar. The main campus in Evanston sprawls 240 acres and features more than 90 school-based centers and over 50 university research centers. Students interested in earning an online master's degree in information technology can pursue a master's in information systems online. The master's program at Northwestern prepares students to advance their careers in information technology management or enter into an information technology career and progress to the management level. The program emphasizes the management and development of software projects existing in the workplace. Students experience a laboratory-based, hands-on curriculum that deepens and broadens their knowledge of new and emerging information technology. The program also allows students to tailor their degree to their personal interests and career goals by choosing a specialization, such as data science, artificial intelligence, project management, and database and internet technologies. Students in the program complete courses covering topics including database administration, database systems design, information security management, and information technology project management. Applicants must hold a bachelor's degree from a regionally accredited institution, boast 3-5 years of professional experience, and demonstrate academic excellence. Florida State University, located in Tallahassee, offers a variety of online programs for students who need more flexibility as they earn their degree. The master of science in information technology requires students to complete 32 hours of graduate coursework, taking four core courses in user needs assessment, management of information organizations, usability analysis, and information systems management. Students can then choose additional courses from one or more specializations or design an individualized program of study. Students earning their online master's degree in information technology can pursue several different areas of specialization, including large-scale data management, user-centered design, technology and networking, and leadership and management. Coursework for FSU's online master's in information technology generally follows a synchronous format, with specific meeting times scheduled one night on Monday, Tuesday, Wednesday, or Thursday from 6pm-8pm or 8pm-10pm. These weekly synchronous class meetings allow students to participate from any location with a reliable internet connection, headset, and microphone. The master's program at FSU typically takes students about two years to complete if they enroll full time, but students can take up to seven years to complete their program. FSU recommends that students take at least two courses for a total of six credit hours each semester; this format allows students to complete their program in approximately six semesters, taking the standard two years. A private, nonprofit research university located in Pittsburgh, Pennsylvania, Carnegie Mellon University began as an institute of technology in 1900. By 1912, the university began granting four-year degrees. The school consistently ranks among the best in computer science and information technology, offering a master of science in information technology to both traditional and online students. The online master of information technology program at CMU features a part-time, asynchronous format, affording students maximum flexibility as they earn their degree. Through their rigorous curriculum, students learn through data-driven management strategies, key communication methods, and technological expertise. They can focus their information technology degree on information technology management, business intelligence and data analytics, information security and assurance, or software design and management. Information technology students at CMU enjoy the opportunity to pursue their degree on campus, online, or through a hybrid format. Coursework covers a variety of topics, including database management, information technology project management, and telecommunications management. Students graduate their program ready to pursue careers as information technology managers, information security specialists, and database administrators. Carnegie Mellon University is regionally accredited by the Middle States Commission on Higher Education (MSCHE). Founded in 1956 in Tampa, Florida, the University of South Florida's Department of Computer Science and Engineering offers a non-thesis option for students pursuing their master of science in information technology. Throughout their information technology program, graduate students develop strong problem-solving skills, information technology skills, and the ability to deploy the necessary technology solutions to achieve organizational and business goals. Students can pursue the program in an online or hybrid format, with the hybrid option allowing them to take both online and on-campus courses. Students in the program enjoy considerable freedom when selecting their courses, choosing those that best coincide with their interests and career goals. Information technology graduate students at USF must maintain close contact with the graduate director to create a coherent plan of study working toward a particular goal. Students should only select elective courses after consulting with the graduate director. Applicants can choose from a spring or fall application deadline and must submit their GRE scores with their admissions application -- along with three letters of recommendation, a statement of purpose, and undergraduate transcripts. Applicants must also hold a bachelor's degree in information technology, computer science, or a related field with a 3.0 minimum GPA. Located in West Lafayette, Indiana, Purdue University offers associate, master's, and doctoral programs online. Students at the university can enjoy maximum flexibility through Purdue's online programs. Not only does Purdue feature fully online programs, students can also enroll in certain hybrid formats, allowing them to take both online and on-campus courses. Purdue offers an online master's degree in information technology project management with no on-campus requirements. The online information technology project management program allows students to focus on schedule development and management, portfolio management, and discovery and management. Courses in the program exist in a rolling format, allowing students to complete their degree at their own pace from any location around the world. These courses feature eight-week formats, allowing students to complete all 34 required credits in one to five years. Students must define their plan of study before they can graduate; these plans outline which courses students choose to pursue each semester. The curriculum covers a wide variety of topics, including program and portfolio management, professional research and communication, and information technology security management. Graduates of the online information technology project management program often go on to pursue careers as project management senior consultants, technical project managers, senior application analysts, and computer engineers. Founded in 1867, the University of Illinois at Urbana-Champaign consistently ranks as one of the best public universities. The university boasts more than 47,000 students from all 50 states and more than 100 different countries and is widely regarded as a leader in teaching, research, and public engagement. Located in Champaign, Illinois, the university's campus houses one of the largest public university collections in the world, with 37 unit libraries holding 13 million volumes. The online master's in information technology program caters to information professionals, and its curriculum emphasizes the intersection of people, information, and technology -- allowing students to develop advanced skills in analysis and information management. The curriculum also explores some of the main social and organizational challenges presented in the information technology field. The program requires three courses: information modeling; sociotechnical information systems; and data, statistical models, and information. Students can choose other courses to tailor their degree to personal interests and career goals, following one of two pathways: knowledge management and information consulting or data science and analytics. Students explore a variety of topics throughout their program including computers and cultures, social aspects of information technology, and web technologies and techniques. Rutgers University in New Brunswick, New Jersey, offers a variety of online programs for students in need of flexibility. The university boasts more than 58,000 students from all 50 states and more than 125 different countries. Online programs at Rutgers feature the same advantages as on-campus programs, including one-on-one attention and small class sizes. Additionally, online programs highlight the added benefit of allowing students to complete their coursework at any place and time. Many students who pursue their master of information at Rutgers want to advance their career opportunities, increase their salary potential, and deepen their knowledge of the field. Graduates can explore career opportunities in fields like data analysis and management, information architecture, and information science. Information master's students can choose a concentration to cater their degree to their personal interests and career goals, and some options for specialization include archives and presentation, data science, and library and information science. All areas of specialization feature coursework geared toward a specific career area, equipping students with the unique knowledge and skills they need to thrive in their career. Rutgers University is regionally accredited by the Middle States Commission on Higher Education (MSCHE). A private research university located in Boston, Massachusetts, Boston University identifies as nonsectarian, although it has historical connections to the United Methodist Church. The university boasts a large student body and serves as one of Boston's largest employers. The award-winning online programs at Boston University are taught by prestigious, expert faculty members who provide the highest quality of education. Students at Boston University can enroll in the online master of science in computer information systems. Boston University offers information technology graduate students the opportunity to pursue a concentration, allowing them to gear their degree toward their long-term career goals and area of interest. Some concentration options include computer networks, data analytics, and database management and business intelligence. Students must complete 40 credits of coursework to graduate, and the program typically takes between 18 months and two years to complete. The online master of science in computer information systems consists of five core courses, one required course, and four electives or concentration courses to deepen expertise in a specific area. Course topics include information systems analysis and design, business data communication and networks, and information technology strategy and management. Boston University is regionally accredited by the New England Commission of Higher Education (NECHE). Chartered in 1821 by an act of the United States Congress, George Washington University identifies as a private research university in Washington, D.C. The university consists of 14 colleges and schools, including the GW Law School, the GW School of Business, and the School of Media and Public Affairs. GWU's online master of science in information systems technology maintains a reputation for providing students with an in-depth understanding of information systems along with communication, management, and decision-making skills. Students enjoy hands-on, dynamic laboratory courses and learn how to integrate management skills and information systems technology to effectively implement business solutions. Online students can visit the campus for an optional orientation at the beginning of their program, and they must complete a mandatory capstone residency at the end of the program. Students can enroll in their program either full time or part time depending on their scheduling needs. Those who enroll part time typically take 2-2.5 years to finish their program, while full-time students take between 18 months and two years to graduate. George Washington University is regionally accredited by the Middle States Commission on Higher Education (MSCHE). A public research institution in Salt Lake City, the University of Utah operates as the state's flagship university. The university offers more than 100 undergraduate programs and nearly 100 graduate programs, including online degree options. Students can pursue an online master of science in information systems and participate in interactive online courses available at all times during the day and week. The program emphasizes the technological side of running a business, providing students with a business-oriented technical education delivered through a highly accessible, interactive online format. Students in the program take a hands-on approach, giving them the skills and experience needed to thrive in their professional life after graduation. The program features a structured curriculum following the same timeline as on-campus versions. Students enjoy access to one-on-one virtual career coaching, which aids them in identifying what their career goals are and how they can reach them. The university allows students to enroll in a hybrid option if they want to combine online courses with on-campus opportunities. Courses begin at the start of the semester and end 16 weeks later. Students often take exams that they must complete within specific timeframes. Courses differ from independent study options in that students cannot complete their work at an extended pace (beyond the 16-week standard), but online students do not need to meet at a certain time or place. The University of Utah is regionally accredited by the Northwest Commission on Colleges and Universities (NWCCU). Functioning as a private, co-educational research university in Hoboken, New Jersey, the Stevens Institute of Technology also features a satellite campus in Washington, D.C. Founded in 1868, the student body represents 47 states and 60 different countries. Stevens Institute of Technology was the first college in America dedicated to mechanical engineering. The 36-credit online information systems master's program encourages students to learn, incorporate, and assess emerging technologies. Those in the program enjoy the opportunity to cultivate a specialized degree, and available concentration options include business intelligence and analytics, project management, software engineering, cybersecurity risk management, and business process management and service innovation. The curriculum in the information systems program covers a variety of topics, including project management fundamentals, financial decision making, data management, and digital innovation. The program features three application deadlines throughout the year for potential students. Applicants need to provide a completed admissions application, their academic transcripts, a professional resume, GMAT or GRE scores, and two letters of recommendation. Some applicants may receive an invitation for an interview for further consideration. All applicants should meet the 3.0 minimum GPA requirement. The Stevens Institute of Technology is regionally accredited by the Middle States Commission on Higher Education (MSCHE). Located in Fullerton, California, California State University identifies as a public university with more than 40,000 students and the largest student body of any of the 23 California State University system campuses. The university offers more than 50 bachelor's degrees and more than 50 master's degrees, along with three doctoral programs. Students can pursue their master of science in information technology through CSU's nationally ranked program. The program functions as a cohort, allowing students pursuing their online master's degree in information technology to stay in the same group throughout their program; this creates an instant network of support and professional networking opportunities. In the program, students learn telecommunications and data communications to support IT and cloud computing services, eCommerce and programming concepts, and practical, pertinent knowledge in the field of cyberinsurance and cybersecurity. Students must complete 30 units of required coursework and maintain a 3.0 GPA in order to graduate. Those who take two classes each semester year round can complete their program in around 20 months. The school offers the program on a part-time basis only, and international students with full-time student visa requirements cannot apply. Before beginning the program, students must complete an orientation seminar, and at the end of the year they must attend another seminar to assess their progress. Students can follow one of two concentrations: data science or information technology management. These concentrations allow students to gain specialized experience in their particular area of interest. California State University is regionally accredited by the Western Association of Schools and Colleges (WASC). Bentley University was founded in 1917 as a school of accounting and finance and relocated in 1968 to Waltham, Massachusetts. Today, the university operates as a private, co-educational institution and offers an online master of science in information technology for students interested in expanding their horizons within their information technology career. Through the program, students gain a working knowledge of the current practices and theories in communications, networks, distributed systems, database technologies, and object-oriented analysis and development used in high-end business solutions. Graduates of the program leave with a thorough understanding of information systems development processes at the team, individual, and project levels. Students interested in combining business with a technical foundation find the program particularly beneficial. Bentley students can earn their master's degree in as little as one year, and coursework covers a variety of useful topics designed to equip students with the skills and knowledge they need to thrive after graduation. Course topics include systems analysis and design, software project management, and enterprise architecture. Although the program does not require internships, Bentley encourages students to participate in at least one internship to gain valuable field experience. Bentley University is regionally accredited by the New England Association of Schools and Colleges (NEASC). Located in the heart of New Orleans, Louisiana, Tulane University of Louisiana began as a public medical college in 1834 and became a comprehensive university in 1847. Tulane functions as a private, nonsectarian research university and is widely considered the most selective university in Louisiana. Tulane boasts a reputation for a diverse student body, with 85% of undergraduates coming from more than 300 miles away. The university features an online master of professional studies in information technology management for students interested in transitioning into leadership roles. The curriculum of the information technology master's program features business-focused technical courses designed to teach students how to effectively integrate human resources and business processes to solve critical business demands. Students can choose from concentrations such as legal issues in information technology, managing the IT department, IT governance and policy, and business of information technology. Choosing a concentration allows students to cultivate their coursework to match their career goals and specific area of interest. Students can further tailor their program to their goals by choosing an elective focus in cybersecurity, software management, or healthcare and business analytics. Applicants do not need to submit GMAT or GRE scores, but they do need to submit a 500-word personal statement, a current resume, a government-issued photo ID, and official transcripts. They must also pay the application fee. Tulane University of Louisiana is regionally accredited by the Southern Association of Colleges and Schools Commission on Colleges (SACSCOC). Commonly known as Virginia Tech, Virginia Polytechnic Institute and State University in Blacksburg, Virginia, is designated as one of six senior military colleges in the United States. Offering nearly 300 programs, Virginia Tech features some acclaimed online programs, including an online master of information technology. The online master of information technology program features a 100% online, top-ranked curriculum. Coursework covers a variety of topics including information systems development, crime and conflict in cyberspace, healthcare information technology, and mobile application development. Virginia Tech highlights several specialization areas to go along with students' foundational courses. Students can pursue specialization in 11 areas, such as software development, health information technology, and business information systems. The asynchronous online format allows students to log on at any time of day to complete their assignments and watch lecture videos. Additionally, the program highlights some synchronous features, requiring students to log on at a specific time to participate in regular discussion sessions with their peers and instructors. Applicants must hold a bachelor's degree from an accredited college or university with a minimum 3.0 GPA. Entering students should boast experience with programming in a modern language. Potential students do not need to submit GMAT or GRE scores. Virginia Polytechnic Institute and State University is regionally accredited by the Southern Association of Colleges and Schools Commission on Colleges (SACSCOC). Emphasizing a distinctive campus and student experience, Webster University boasts a historic campus in St. Louis, Missouri. Webster began in 1915 as one of the first Catholic women's colleges west of the Mississippi River, progressive for its time in providing higher education to women. Today, the university highlights a diverse student body and offers a variety of undergraduate and graduate programs, including many online degrees. Students interested in learning how to effectively design, plan, select, and implement information and computing technologies can enroll in the online master of arts in information technology management. In the information technology management program, students learn important terminology, principles, facts, and concepts used in information technology management when developing solutions to complex problems in the field. Students must complete 36 credit hours of coursework covering topics including information and communications systems and networks, organizational behavior, and information technology management. Applicants must hold a bachelor's degree from an accredited higher learning institution and a 2.5 minimum GPA. Application requirements vary for students of different backgrounds, including military students and international students. Webster University is regionally accredited by the Higher Learning Commission (HLC). Functioning as a public research university, Indiana University boasts a campus with over 40,000 students and serves as the largest university in the state. Students can pursue a variety of undergraduate and graduate programs including several online options. Those interested in integrating business with information technology can enroll in the online master of science in information technology management program. Designed for working professionals in the information technology industry looking to accelerate and advance their careers, the program helps meet the constantly growing demand for IT leaders. The 30-credit program offers a full-time and part-time option. Students who enroll full time can complete the program in as little as 15 months, while those who enroll part time can take up to three years to graduate. Ideally, the master of information technology management program builds on skills students developed in undergraduate business, informatics, information technology, computer science, or engineering programs. Students with an MBA can build upon their business expertise and develop their analytical abilities while completing courses from a variety of topics that prepare them for successful careers as information technology specialists and managers, information technology project managers, or information technology directors. Indiana University is regionally accredited by the Higher Learning Commission (HLC). With Chicago's tradition of innovation going back more than 125 years, IIT constitutes one of the country's leading technological universities. Ranked in the top 100 national universities by the U.S. News & World Report, this institution continues to make its mark on research, science, and technology. IIT pioneers program delivery, as well, creating some of the first televised programs, which later moved online. The master's in information technology and management (ITM) from IIT's applied technology school represents one of the many online programs available. In this program, students acquire the foundational skills to work in the competitive IT landscape, along with the career-focused training to allow for entry into a specific field. Students may choose a general course structure, craft their own curriculum and specialization, or choose from one of the nine career-driven specializations. These include technology infrastructure, systems analysis, data management, and software development. In each of these layouts, ITM learners must complete 30 credit hours and earn a 3.0 GPA to graduate. For students without a specialization, IIT requires 21 core credits. Students with a specialization must complete only nine core credits, including at least three mandatory credits in business development, system technologies, or software development. IIT delivers most of its online master's degrees in information technology on an asynchronous basis, meaning students enjoy flexible course schedules. Each course follows the same 16-week semester schedule as traditional campus courses, without the on-campus requirements. Not all specializations offer fully online access, though most courses do feature flexible options. While IIT does not require its master's students to hold a bachelor's degree in IT, admissions officers prefer applicants with computer experience. IIT holds regional accreditation from the Higher Learning Commission (HLC). Backed by the Rocky Mountains in Colorado, Regis University consistently ranks as one of the best schools in the West in U.S. News & World Report. More recently, the school's high-quality online programs carry the bulk of industry recognition. With 80 online programs available, Regis now represents one of the best online schools, and its computer and information sciences college hosts several of those programs. The MS in information technology, which the U.S. News & World Report ranks as one of best online master's programs in information technology in the country, features an online format that enables students to work and study simultaneously. The degree offers 10 emphasis options, including cybersecurity, healthcare informatics, and software engineering. Learners must complete 36 credit hours to graduate, nine of which focus on the student's emphasis, and nine on core courses. For the other required credits, students take electives and degree required course -- completing a thesis, capstone, or practicum. At Regis, online students benefit from six start dates through the year. The asynchronous, flexible course loads at Regis result in various program lengths, but most learners take one class per eight-week semester. These students complete 18 credits per year, and graduate in two years. Applicants to Regis must hold either a bachelor's degree with a 3.0 GPA and three years of relevant work experience or a bachelor's degree in a computer-related field. Regis holds regional accreditation from the Higher Learning Commission (HLC). Based in Fayetteville, UA serves as the flagship campus of the University of Arkansas System. For more than 145 years, UA students benefited from on-campus offerings. Now, the institution looks to grow and enhance its online programs. With online degrees like the master's in information systems (MIS), students from all over the country can live the UA experience from their homes. Hosted by UA's business college, the part-time online MIS degree offers working professionals the skills and qualifications to find careers in information systems and analytics. The program provides hands-on experience through real enterprise data sets, ensuring graduates understand how to best apply their knowledge and skills in working situations. Students choose between a concentration in enterprise resource planning or systems management. This 30-credit online information technology master's degree includes foundational courses in analytics and enterprise systems. Classes start each fall, and students take six credits per semester for five total semesters. In their second year, they choose a concentration. In total, students can complete their degree in 21 months. Most courses feature online delivery, but the MIS program requires learners to attend one on-campus session each month. These sessions take place on Saturdays at the Fayetteville campus. To gain admission, applicants must hold a bachelor's degree and at least two years of work experience in a related field. Before starting classes, students must attend an on-campus orientation in August. UA also recommends that MIS students attend the one- or two-day workshop following the orientation. UA holds regional accreditation from the Higher Learning Commission (HLC). The online MIS program is accredited by the Association to Advance Collegiate Schools of Business (AACSB). Originally Texas' first two-year junior college, DBU's academic history dates back to 1898 in Decatur. A century later, DBU again helped pave the way for Texas education by offering online programs for the first time. Now, with more than 75 degrees available online, the school continues to make education more accessible and flexible for students everywhere. Hosted by the school's business college, the online MBA with a concentration in management information systems (MIS) teaches students to use MIS technologies as a means of enhancing business strategies and providing business solutions. As one of 15 concentrations available, the MIS track comprises 36 credits. Of the 36 credits needed to graduate, students must take 24 credits in core business training. The 12 concentration credits include courses in IT security, database management, systems analysis, and networks. While the MIS concentration features no on-campus requirements, students may choose a blended course option if they wish to attend some classes in person. The online programs at DBU offer great flexibility. Courses run asynchronously, allowing learners to study at their convenience, but some courses may offer web-conferencing options, as well. Most programs feature start dates in each of the four semesters, and the typical graduate student completes approximately 25 credits per year. For admission to the online master's in IT, applicants must complete prerequisite courses in research and finance foundations, along with a bachelor's degree, a 3.0 GPA, and a GMAT score of 425. DBU allows for up to 12 transfer credits. DBU holds regional accreditation from the Southern Association of Colleges and Schools (SACS). The online MBA program is accredited by the Association to Advance Collegiate Schools of Business (AACSB). In 2008, CSU Global began enrolling students as the first fully online state university in the country. The global campus provides flexible study options for working professionals from around the world, including bachelor's degrees, master's degrees, and certificates. Students benefit from numerous online resources, like career services, academic support, and an extensive digital library. The master's in information technology management offers students the chance to develop leadership skills and learn to implement effective IT operations within organizations. Graduates prepare for industry and vendor certification exams, gaining skills in programming, systems analysis, and IT troubleshooting. CSU global students also receive partner discounts for the CompTIA exam. The 36-credit master's degree in information technology online includes 24 core credits and 12 specialization credits. Core courses focus on IT fundamentals, whereas specializations enable students to pursue training in areas like cybersecurity, business intelligence, and fraud management. CSU Global delivers courses asynchronously, allowing for accelerated study, as well. Each course offers monthly start dates and accelerated eight-week courses for students looking to complete a program more quickly than normal. For IT management program admission, applicants must hold a bachelor's degree and a 3.0 GPA. CSU Global may allow for up to nine transfer credits from students transferring from an accredited institution. CSU Global holds regional accreditation from the Higher Learning Commission (HLC). Since the late 1800s, students have studied at and lived on the OSU main campus. Thousands of students each year still attend the Stillwater campus, and many benefit from the university's flexible online degree offerings. A leader in that regard, OSU's school of business offers several fully online degrees, including the MS in management information systems (MIS). In this online master's degree in information technology, students master the convergence of business and technology, learning to utilize and further develop these systems to improve business performance. The 33-credit program features concentrations in data science or application development. Students complete 22 core credits and 12 concentration credits, along with a practicum. OSU may allow some students to choose between an internship and another course. The online MIS program at OSU affords students great flexibility. These classes run asynchronously and allow for heavier course loads when permitted. Most graduate students complete their degrees in 2.5 years, and some may finish sooner. MIS learners gain access to standard student services, and benefit from the Management Information Systems Graduate Students Association, which provides mentoring and support. For admission into the MS in MIS program, students must submit GMAT scores of 550 or GRE scores of 305, along with a bachelor's degree and a 3.0 GPA. OSU does not require prior experience, though candidates with computer and business experience may receive preference. OSU allows transfer credits, but encourages students to speak with an admissions representative for more information. OSU is regionally accredited by the Higher Learning Commission (HLC). The online MS in MIS holds accreditation from the Association to Advance Collegiate Schools of Business (AACSB). Home to some of the country's brightest minds and fastest-growing research hubs, ASU represents one of the most reputable centers of research and innovation. In fact, U.S. News & World Report ranks ASU as the most innovative school in the nation. With more than 110 distance learning degrees available, ASU boasts one of the most extensive online catalogs. The online MS in information management offered through the business school and information technology department provides students with the expertise to incorporate cutting-edge technology into an organization's business strategies. The 30-credit degree highlights emerging technologies, enterprise systems, and information-enabled business modelling. Students enrolled in the online master's program in information technology take one course every five weeks. Students can complete the entire degree in less than 16 months. While most courses run asynchronously, some feature set class times and interactions. ASU offers multiple start dates throughout the year and requires only one campus visit throughout the entire degree. Successful applicants should hold a bachelor's degree with a 3.0 GPA. ASU allows some students to transfer in up to 12 credits from other accredited institutions, permitted they earn a B grade or higher. Online learners gain access to a pool of resources, including student services, the school's digital library, and academic planning and support. ASU is regionally accredited by the Higher Learning Commission (HLC). The online master's in information management holds accreditation from the Association to Advance Collegiate Schools of Business (AACSB). Based in North Texas, UT Dallas draws students from all over the state to its campuses. Through the university's online programs, however, more students can earn a UT Dallas education, with fewer restrictions. The school of management leads the way in creating these online programs, now offering seven degrees online. The MS in information technology management (MS ITM) prepares students to use technology as a tool to improve business operations. The program starts with IT and business foundations, eventually covering the meeting ground between these fields and the complex issues that take place there. Afterward, students can choose from five available concentrations, including business analytics, cybersecurity, IT consulting, enterprise systems, and healthcare systems. In this 36-credit degree, students take 18 core credits and 18 electives. Mandatory core courses include programming, data management, and project management. For the electives, learners can work toward a concentration or a certification. The program prepares for several industry and vendor certificates, including Certified IS Auditor and CompTIA Security+. Students may take internships for credit, as well. Students typically complete the online information technology master's degree in 18-24 months. Most courses run asynchronously, but some may require scheduled class times. The average admitted student boasts a bachelor's degree with a 3.3 GPA, GMAT scores above 600, and GRE scores above 310. UT Dallas accepts up to nine credits from other accredited institutions. Once admitted, students must complete a prerequisite course in professional development. UT Dallas is regionally accredited by the Southern Association of Colleges and Schools (SACS). The online MS ITM program holds accreditation from the Association to Advance Collegiate Schools of Business (AACSB). Located in Fairfax, VIU designs its programs to allow students maximum flexibility and personalization in their studies. The school of online education plays a big role in that, offering 16 online degrees, including 12 at the graduate level. VIU's online students gain access to cutting-edge online education technology, an extensive digital library, and various student support services. The online MS in information technology equips students with the skills and expertise to match IT solutions with business problems. Armed with leadership, architecture, design, and development skills, graduates gain access to a range of leadership careers in the IT field. In total, the typical student completes this online master's in IT in two years. The 36-credit MS in information technology program comprises 21 core credits and 15 elective credits. In general, the core courses cover fundamentals, and the electives allow students to specialize in areas of interest. As part of the electives requirement, students may complete an internship, a thesis, or an independent study. Online programs at VIU allow students to choose among six start dates. With asynchronous course delivery and no campus visits required, online students can customize their study schedules around their home lives. Typically, students take nine credits each eight-week semester, though VIU may permit alternative schedules. Students admitted to the MS in IT program, however, must complete prerequisite courses in programming, networking, operating systems, and database systems. Transfer students may benefit from VIU's transfer credit allowance of up to 50% of the degree. VIU is nationally accredited by the Accrediting Council for Independent Colleges and Schools (ACICS). Situated in Newark, New Jersey's economic capital, NJIT focuses on advancing research and technology and developing the surrounding business and IT communities. Its college of computing, one of the few of its kind, contributes to this focus. NJIT offers degrees and certificates dedicated to computing and technology, making several graduate degrees available for online study. In the online MS in information systems (MSIS), students learn to utilize technology in decision-making and management. The 30-credit MSIS program offers a blend of asynchronous and synchronous courses, offering a flexible alternative to on-campus delivery. Of the 30 required credits, information systems core courses take up 15, and user experience and analytics courses take up six. Students then choose electives to satisfy their remaining six credits. The master's degree in information technology online allows students to complete a thesis or specialization within these elective requirements. Some possible specialization options include analytics, business, design, security, and healthcare informatics. Students may also build their own specializations with the help of an adviser. MSIS students may also choose a 36-credit professional management option. In addition to adding a potential capstone and co-op component to the degree, this option provides a management specialization and professional and technical communications specialization. Successful applicants possess a bachelor's degree, quality grades, and strong graduate test scores. The MSIS program does not require an IT-related bachelor's degree for admission, but students may need to complete bridge courses to build a solid foundation. Since 1971, Liberty University has shaped higher education from its Lynchburg, Virginia campus. In 1985, Liberty began pioneering distance education, which eventually led to fully online degrees. Today, in addition to a wide selection of online degrees at every level, Liberty offers online academic support, an online library, and online career services assistance. Offered through the business school, the MS in information technology provides students with the skills and knowledge to manage and maintain IT systems within organizations of all sizes. Students learn to design and implement appropriate IT solutions to serve various business needs and develop the skills to work with new and emerging technologies. The MS in IT program allows students to complete the required 36 credit hours within 18 months. In addition to the core courses in business and information technology, students can opt to take on a specialization in network design or software design and management. Online programs at Liberty run in eight-week semesters, featuring several start dates through the year. While most online courses run asynchronously, some may feature specific class schedules. Students may qualify for this online master's degree in information technology with a bachelor's degree in any area and a 3.0 GPA, but the program mandates several prerequisites courses in algebra, statistics, and programming. Transfer students may qualify for up to 50% of the degree in transfer credits, as long as the credits come from an accredited school and program. Liberty holds regional accreditation from the Southern Association of Colleges and Schools (SACS). The online MS in information technology program is accredited by the Accreditation Council for Business Schools and Programs (ACBSP). As one of the largest schools in one of the largest public university systems, TU makes a considerable impression on Maryland's educational system. With the advent of the Towson Learning Network, TU extends its reach beyond state borders. In addition to its various partnerships and support programs, the institution offers more than 16 online graduate degrees, including several from TU's emerging technologies school. Students in the MS in applied information technology program learn to design and integrate information systems to solve business and work challenges. Students obtain the skills to work with the newest technologies and systems, and complete the requirements for at least one post-graduate certification. The entire online master's program in information technology comprises 33 credits, 15 of which apply to a certification. The many certification options include database forensics, health information technology, and software engineering. Students dedicate the other 18 credits to information technology electives. Eligible students may pursue independent study, and those working in the IT field may pursue an internship. TU offers course and schedule flexibility to online learners, but some students may not find all their courses online. Most full-time online students completes nine credits per semester, finishing their programs in less than 18 months. TU's online master's in information technology program features start dates in each of the three semesters, and it admits students with accredited bachelor's degrees in any subject and a 3.0 GPA. The program does not require prior IT education and experience, but students may need to complete preparatory courses before starting their degrees. TU holds regional accreditation from the Middle States Commission on Higher Education (MSCHE). UMBC strives to propel Maryland into the future and further develop the state's economy and citizens through research and innovation. Ranked as one of the top 10 innovative schools in the country by the U.S News & World Report, UMBC also hosts high-ranking programs, including graduate computer IT programs. The online MS in information systems prepares students to design and utilize technology as a means to navigate the digital transformation of business. Graduates acquire the training and skills to land careers in traditional information systems professions or positions with businesses looking to adapt to a changing environment. The 30-credit degree runs asynchronously online, which allows working professionals to attend classes without disrupting their schedules. 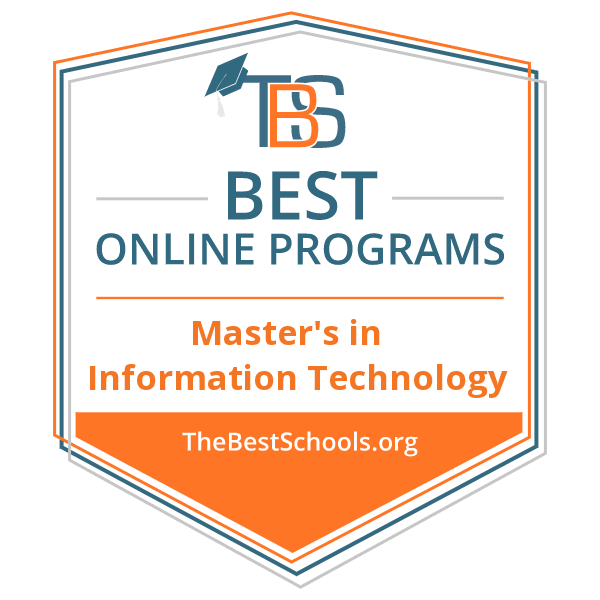 Of the 30 credits required, the online information technology master's degree includes 12 core credits and 18 credits in advanced information systems courses. Core courses include systems design, networks, information systems, and database management. Students may complete a thesis or independent study as part of the advanced course requirements. Most students take three credits in each of the three semesters, completing their degrees in 30 months. Learners looking to take a heavier course load can contact an academic adviser. Admission to UMBC requires a bachelor's degree and a 3.0 GPA. Those without prior IT experience or education may need to complete a fundamentals course, bringing the total degree credits up to 34. UMBC allows students to bring in up to six transfer credits from an accredited university or college. UMBC is regionally accredited by the Middle States Commission on Higher Education (MSCHE). One of the oldest and largest universities in Alabama, Auburn made a substantial contribution to the state's growth over the years. To provide greater access and more flexibility in students' studies, the institution introduced Auburn Online, which enables learners to complete courses and entire degrees online. Auburn's business college created the online MS in information systems (MSIS), one of the most flexible of all available degrees. The MSIS provides experienced IT professionals with the skills to advance into leadership positions. Considered an open program, the MSIS only features three mandatory courses. All students complete courses in database management and systems analysis and design -- plus a final project. Students exercise freedom in filling out the rest of the degree, choosing among various electives and program options. Students can choose from several available concentrations, including business analytics, information assurance, and security. Depending on their course load, students typically complete this online master's in IT in 2-3 years. Most courses offer asynchronous delivery, though some may feature scheduled class times. Applicants must hold an accredited bachelor's degree in any subject, and those with no business experience may need to complete some business foundation courses before starting the program. Furthermore, online students with minimal work experience must take professional development classes within the career services department. Auburn holds regional accreditation from the Southern Association of Colleges and Schools (SACS). The online MSIS program is accredited by the Association to Advance Collegiate Schools of Business (AACSB). Mississippi State University was founded as the Agricultural and Mechanical College of the State of Mississippi in 1878. Based in Starkville, the university boasts numerous research centers and enrolls more than 21,000 students through nine colleges. MSU's College of Business offers an online MS in information systems that prepares students for work as IT consultants, software developers, and information security analysts. The university's MS in information systems program teaches information technology concepts from a business perspective. Before beginning core coursework, students take foundational business courses on topics including financial accounting, statistics, economics, and marketing. Information systems coursework includes classes in database design, business telecommunications, and information technology administration. MSU provides online versions of many on-campus resources. New graduate students can complete a five-hour online orientation to become familiar with distance learning and their specific courses. Students can schedule online tutoring appointments through MSU's writing center. In addition, the university assigns each online student a distance coordinator who can answer questions and direct the student to resources. Mississippi State University is regionally accredited by the Southern Association of Colleges and Schools Commission on Colleges (SACSCOC). The online MS in information systems program is accredited by the Association to Advance Collegiate Schools of Business (AACSB). The University of Dallas is a small, Catholic institution based in Irving, Texas. Founded in 1956, the school enrolls about 2,500 students in on-campus and online courses. UD's business college offers an online MBA with six concentration options, including information and technology management. The university's MBA in information and technology management program teaches students the business and technology skills they need to become IT directors, chief information security officers, and chief technology officers. The 42-credit program comprises 14 courses, including 10 core business courses in topics such as value-based marketing, data-driven decision-making, and managing complex organizations. Information technology management classes cover subjects including technological trends, enterprise architecture, and IT strategy. MBA students apply classroom knowledge during a capstone experience in their last semester. Under the supervision of a professor, students work in teams to consult for an organization. Students develop a proposal, meet regularly with the client, and present a report at the end of the semester. Full-time professionals typically earn the MBA with a concentration in information technology in 2-3 years. Learners can complete the program entirely online, entirely on campus, or in a hybrid format. The University of Dallas is regionally accredited by the Southern Association of Colleges and Schools Commission on Colleges (SACSCOC). The MBA program is accredited by the Association to Advance Collegiate Schools of Business (AACSB). Founded in 1901, Golden Gate University is a private, nonprofit institution based in California's Bay Area. GGU offers undergraduate and graduate online programs in nearly 20 areas of study, including business analytics, finance, and project management. Students can also pursue an online master's in IT management. The online MS in IT management comprises 36 units. Some students begin the program by taking a foundational data analysis course, while learners with significant undergraduate IT experience begin with more advanced coursework. The rest of the program consists of eight required courses and three electives. Required coursework includes a capstone course in strategic IT planning, organization, and leadership. Students can forego their free electives to pursue a business analytics concentration. The IT management master's degree prepares business professionals for leadership positions in information systems and technology. Applicants to the program need substantial educational or professional experience in the field. Applicants need either 30 undergraduate credits in IT or three years of work experience in an IT division. GGU also considers business and engineering managers with four years of experience. Domestic students complete the curriculum asynchronously; they can study full or part time, and they progress through the curriculum at their own pace. International learners complete the program alongside a cohort. Students can enroll in any term. Golden Gate University is regionally accredited by the WASC Senior College and University Commission (WSCUC). Marist College, located in Poughkeepsie, New York, offers 75 programs at the bachelor's, master's, doctoral, and certificate levels. Marist students can pursue fully online MBA, MPA, MS, and MA degrees. The college offers an online MS in information systems with three tracks: information systems management, business analytics, and computer networks and security. The information systems management track emphasizes IT's role in business and explores the practical applications of information systems. The business analytics concentration teaches students to collect, analyze, interpret, and manipulate data sets. Business analytics students gain experience using cutting-edge tools to predict trends and make decisions. The computer networks specialization trains learners to design, monitor, and secure computer systems. Graduates often become security analysts and network administrators. The curriculum comprises 36 credits, including 21 core credits. Depending on the student's concentration, they may take 2-3 electives in information systems, software development, and business. Regardless of concentration, the MS in information systems helps learners develop managerial and technical skills. All students take core courses in accounting, data management, and systems design. Students also complete an information systems policy class and a capstone project. Applicants to the MS in information systems program do not need a technology background. Applicants must submit unofficial transcripts and a current resume. They must also submit a personal statement explaining their career goals and their reasons for choosing Marist's MS in information systems program. Marist is regionally accredited by the Middle States Commission on Higher Education (MSCHE). Founded in 1944, Fresno Pacific University ranks among U.S. News & World Report's top regional universities in the West. FPU offers many online bachelor's and master's programs, including a fully online school library and information technology degree. The university's MA in education with a school library and information technology emphasis prepares students for roles as school librarians and library media specialists. Graduates gain experience with the latest educational technologies and learn about a variety of instructional strategies and resources. The program equips graduates to manage library media in K-12 schools. MA in education students complete 37 credits, including nine education courses and four core MA classes. A class on information technologies explores popular information and communication technologies for school libraries. A school media center administration class teaches students to implement policies and to supervise employees. A core course in values in school and society explores education from various cultural, philosophical, social, and historical perspectives. The program offers start dates in August, October, January, and March, and students typically graduate in 3-3.5 years. Applicants must submit an application form, a statement of intent, and official undergraduate transcripts. Applicants need a minimum 3.0 GPA, and those with a lower GPA must write a letter of explanation. Fresno Pacific University is regionally accredited by the WASC Senior College and University Commission (WSCUC). The MA in education is accredited by the California Commission on Teacher Credentialing (CTC). Founded in 1949, George Mason University has quickly become the largest public university in Virginia, serving more than 34,000 students. Mason ranks number 28 on U.S. News & World Report's list of the most innovative universities in the country. The school offers hundreds of undergraduate and graduate programs, and Mason's more than 50 online options include a master's in applied information technology. The MS in applied information technology with a cybersecurity concentration requires 30 credits. Students take four core courses and at least six cybersecurity courses. Concentration classes cover topics including penetration testing, cloud computing security, and secure software development. Students can complete the entire curriculum online through asynchronous coursework, and online course offerings vary each semester. Students learn about information technology from various perspectives; the program boasts courses taught by engineering professors, humanities professors, business professors, and industry leaders. Applicants must submit an online application and an application fee. They must also provide all postsecondary transcripts, two letters of recommendation, a professional and academic goals statement, and a resume. Applicants to the MS in applied information technology program need a minimum 3.0 GPA and IT experience. Applicants can request an interview. George Mason University is regionally accredited by Southern Association of Colleges and Schools Commission on Colleges (SACSCOC). Western Governors University is a nonprofit online university established by 19 U.S. governors in 1997. The school offers over 50 degree options in business, healthcare, education, and information technology. WGU's MS in information technology management prepares students for IT leadership roles by developing key skills in ethical leadership, data modeling, IT strategy, and project management. The 10-course curriculum teaches students about emerging technologies and leadership strategies. The MS in information technology management explores IT from an international perspective through courses on technological globalization and IT sourcing in a global economy. Students complete the entire program online through asynchronous, self-paced classes. After completing a course, students can move on without waiting for the next semester to start. WGU boasts a competency-based education model tailored to working IT professionals. After students master a topic, they demonstrate their competency through assessments such as tests and papers. The competency-based format lets students move quickly through material they already know and spend more time on unfamiliar topics. Most master's in information technology management students graduate in 6-24 months. Applicants must submit an official undergraduate transcript and meet with an enrollment counselor. WGU charges a per-term tuition rate that allows students to save money by completing coursework faster. Information technology professionals can earn credit for previous industry certifications. Established in 1868, the University of Wisconsin Whitewater is a public university that offers dozens of degrees through five colleges. The university's MBA in information technology management prepares students for leadership roles in IT companies and departments. The 36-credit curriculum explores ways to improve business performance through effective IT management. Students complete 24 core credits, nine credits in their area of emphasis, and three elective credits. Business coursework covers topics including business valuation, innovation management, and social responsibility of business. Through IT coursework, master's students explore topics such as business process innovation, data analytics, and business intelligence. A course on disaster recovery and business continuity teaches students to plan for disruptive events and crises. Applicants must hold a bachelor's degree from an accredited institution and must have an undergraduate GPA of at least 2.75. Some students must complete up to 14 credits in basic business areas, such as accounting, statistics, economics, and finance. UW-Whitewater waives most or all foundational course requirements for students with a bachelor's degree in business. The University of Wisconsin Whitewater is regionally accredited by the Higher Learning Commission (HLC). The MBA program is accredited by the Association to Advance Collegiate Schools of Business (AACSB). The University of Arizona is a large public school based in Tucson. Among the most respected institutions in the country, UA ranks in the top 50 on U.S. News & World Report's list of the best public universities. The school's 20 colleges offer nearly 400 undergraduate and graduate programs. The university offers more than 100 online programs, including an MS in management information systems. The management information systems program helps students with at least two years of work experience qualify for senior-level IT positions. Students become effective decision-makers through coursework on business intelligence, risk management, and business foundations. They also develop essential technical skills through classes on data management, software integration, and information security. Management information systems students complete 10 courses for a total of 30 credits. Learners take accelerated, eight-week classes and can finish the program in as few as 10 months. UA accepts new information systems students six times per year, and all distance learners pay the same tuition rate, regardless of state residency. Online students enjoy access to various resources. Through the online career center, students can connect with alumni mentors in their field. UA also offers academic skills coaching to help learners develop good study and time-management habits. Online students can meet with math and writing tutors and can set up research consultations with librarians. The University of Arizona is regionally accredited by the Higher Learning Commission (HLC). Established in 1894, the University of Massachusetts Lowell is a public research university that offers more than 100 undergraduate majors, 40 master's programs, and 30 doctoral programs. UMass Lowell offers 62 online programs, including an MS in information technology. The online master's degree in information technology emphasizes the technical abilities students need to design, manage, and implement complex computer networks. Students become proficient with Windows, Apple, and Linux platforms. They also study general topics related to system administration, cloud computing, and networking. IT students take 10 courses totaling 30 credits. They choose two courses on system infrastructures, two courses on network infrastructure, two software management classes, and four electives. Notable classes explore large-scale application deployment and intrusion detection systems. Applicants must submit an application, a statement of purpose, letters of recommendation, official transcripts, and a resume. They should also complete prerequisite undergraduate coursework in precalculus, discrete math, statistics, C programming, and data structures. UMass Lowell does not require applicants to the master's program in information technology to submit GRE scores. In-state and out-of-state online students pay the same per-credit tuition rate. UMass Lowell provides academic advising to distance learners through phone calls, video conferencing, and email. Admitted students can attend a live online orientation and enjoy access to 24/7 technical support. The University of Massachusetts Lowell is regionally accredited by the New England Commission of Higher Education (NECHE). Montclair State University is a public research university founded in 1908. The school enrolls 21,000 students, making it the second-largest university in New Jersey. Montclair offers more than 300 programs at the bachelor's, master's, and doctoral levels and provides resources through 38 centers and institutes. Montclair offers seven online graduate degrees, including one of the country's top online master's programs in information technology. The MS in information technology focuses on applied information technology. The program offers advanced training in developing and managing communication and computing technologies. Students explore how businesses and governments leverage technology systems, and they study the role IT plays in an organization's communications, management, and legal operations. Information technology master's students complete 33 credits. The program's five required courses include a human-computer interaction class that covers user interface design. Students in the course construct paper mockups and digital prototypes. Learners also take courses in communication, cyberlaw, and project management. The remaining credits comprise electives and a capstone. During the culminating experience, students collaborate with industry professionals and faculty members to analyze problems in the IT field. Applicants must submit official undergraduate transcripts, three letters of recommendation, an application, and a resume. Montclair State University is regionally accredited by the Middle States Commission on Higher Education (MSCHE). Central Michigan University is a public research university based in Mount Pleasant. Founded in 1892, CMU offers about 300 academic programs at the undergraduate to doctoral levels. The school also offers 32 online programs, and about 20% of students at the main campus take some online classes. Students in the online MS in information systems program develop business and communication skills while learning to construct, maintain, and repair information systems. Students complete 36 credits through seven required courses, three concentration classes, and two electives. Learners can choose a track in enterprise systems, cybersecurity, or project management. Toward the end of the program, students complete a capstone requirement that involves planning, designing, implementing, and testing an advanced information systems project. Learners complete the entire curriculum online through eight-week, 12-week, and 16-week courses. Distance learners at CMU can access online resources such as the university's Online Ally program, which connects new students with experienced distance learners who help with assignments, planning, and time management. An online writing center helps students improve their essays through help with brainstorming, outlining, and editing. CMU's Math Assistance Center provides virtual tutoring. Applicants must hold a bachelor's or equivalent degree from a regionally accredited institution. Applicants need at least a 2.7 overall GPA or a 3.0 GPA in their last 60 undergraduate credits. Central Michigan University is regionally accredited by the Higher Learning Commission (HLC). Founded in 1866, Milligan College is a private Christian institution in northeastern Tennessee. Milligan enrolls about 1,200 students and offers more than 100 undergraduate and graduate programs. Despite its small size, Milligan operates several schools, including a seminary school and the School of Sciences and Allied Health. The School of Business and Technology offers an online MS in information systems. Milligan students earning the master's degree in information technology online take 10 courses, including classes in emerging technologies, project management, and information security. Students develop an extensive white paper through a five-credit capstone project. The MS in information systems program follows a cohort-based model, with new cohorts beginning each fall. Students complete some courses entirely online and some classes in a hybrid format. Online courses incorporate weekly or bi-weekly synchronous discussion sessions. Hybrid classes require monthly, Saturday sessions on campus. Between in-person sessions, students in hybrid courses complete assignments and participate in discussions online. Students typically earn their information systems master's degree in 14 months. Applicants must hold an undergraduate technology degree or boast at least two years of professional experience in the IT field. Students must demonstrate basic knowledge of accounting and management principles or take online leveling courses. Applicants with a GPA between 2.75 and 2.99 must submit GMAT scores; Milligan does not require standardized test scores for applicants with at least a 3.0 GPA. Milligan College is regionally accredited by the Southern Association of Colleges and Schools Commission on Colleges (SACSCOC). Serving more than 35,000 students, Kennesaw State University is the third-largest higher learning institution in Georgia. The school offers more than 100 academic programs, including more than 70 online degrees, endorsements, and certificates. Students can complete the entire 30-credit MS in information technology program online. All IT students take 12 credits of required courses in design, service delivery, system integration, and information systems security. Students can pursue a thesis or non-thesis track. Thesis learners take a research seminar, while non-thesis students complete a capstone course in their last semester. The non-thesis option includes five electives, and thesis students take three electives. Students can use their electives to specialize in a focus area such as health information technology, which includes courses in health information security, health record systems, and clinical processes. Learners specializing in data management and analytics may take electives that explore data visualization, database security, and database administration. Applicants must submit undergraduate transcripts, two letters of recommendation, a resume, and a statement of purpose. Applicants need at least a 2.75 GPA, but Kennesaw State considers those with lower GPAs on a case-by-case basis. Applicants to the MS program do not need an academic background in IT, but students with little technology experience may need to take foundational courses in areas including software development, computer networks, and databases. Kennesaw State University is regionally accredited by the Southern Association of Colleges and Schools Commission on Colleges (SACSCOC). Nova Southeastern University, based in Fort Lauderdale, Florida, offers more than 150 undergraduate and graduate degrees through 18 colleges, schools, and centers. Students can pursue an online information technology master's degree through the university's College of Engineering and Computing. The MS in information technology requires 30 credits and offers three concentration options and a general track. Students focusing in data analytics, application development, or information assurance take three concentration-specific courses. Learners who choose the general track complete five electives. Regardless of concentration, all students take five core courses on topics including software development, telecommunications, and platform technologies. Students without adequate technical knowledge may need to complete a prerequisite course on programming, data structures, and algorithms. Students can complete the MS in information technology entirely online or through evening classes. MS students take classes during a 16-week fall term, a 17-week winter term, and a 12-week summer session. Full-time students earn the degree in 12-14 months, while part-time learners generally require 16-24 months. Applicants must submit an online application, official transcripts, and a resume. They must hold a bachelor's degree in science, math, engineering, or business and must demonstrate knowledge of structured programming. Applicants need at least a 2.5 undergraduate GPA. Located in Stephenville, Texas, Tarleton State University offers classes on campus at several in-state locations, plus blended programs and online degrees. A Texas A&M University System member since 1917, Tarleton offers close to 100 degrees to its students. Online, the school offers 19 full degrees, including 10 master's degrees. The online MS in information systems, delivered through Tarleton's business administration college, combines knowledge and skills in areas of business operations and information systems. Students learn to analyze business concerns and develop solutions using IT tools and resources, like scalable databases and network systems. Most students complete the 36-credit program in approximately 18 months. In the master's degree in information technology online, students take 21 credits in core information systems, including courses in managing information systems, database management, and research methods. Electives compose the other 15 credits, and students may choose a thesis option to fulfill part of the requirements. To graduate, students must also complete a comprehensive exam. For program admission, Tarleton accepts students with a bachelor's degree and a 2.5 GPA. At Tarleton, online courses typically include a blend of asynchronous delivery and synchronous interactions. Students in the MS in information systems program receive free access to Microsoft Imagine software and professional development opportunities, including a membership with the Association of Information Technology Professionals. Tarleton is regionally accredited by the Southern Association of Colleges and Schools (SACS). The online MS in information technology program holds accreditation from the Accreditation Council for Business Schools and Programs (ACBSP). In addition to its high-quality, on-campus programs, UC represents one of the first online schools in the country. Now, with nearly 100 online degrees available, students from around the world can attend UC classes. Online courses allow aspiring information technology professionals to attend one of the few institutions recognized by the NSA as a center of excellence in cyberoperations and cyberdefense. The online MS in information technology teaches students to solve personal and business problems using technology. Graduates possess the skills to design, create, and implement technological solutions for organizations in various industries. Students can complete the 30-credit degree in one year through full-time study across the three semesters. UC requires part-time students to complete their degrees within three years. As part of the online master's degree in information technology, students must complete nine core credits, including research methods, human computer interaction, and information technology courses. They must also complete at least 15 elective credits in information technology. Students then receive the option to complete a three-credit capstone project or six-credit thesis. Those who choose the capstone must take an additional IT elective. UC may accept students with a bachelor's degree in any field and a 3.0 GPA. Applicants without IT experience, certificates, or education, however, must complete up to four bridge courses to prepare them with the necessary fundamentals. The program's asynchronous delivery supports working professionals and encourages students to find employment in the IT field while studying to enhance the learning experience. North Carolina Agricultural and Technical State University is a public research university based in Greensboro. The school offers more than 200 programs through nine schools and colleges, including an online MS in information technology. Graduate IT students develop the theoretical knowledge and practical skills needed to pursue advanced positions in management and IT. The 30-credit curriculum includes three core courses that deliver foundational knowledge in project management, statistical methods, and communication skills. Students develop an advanced understanding of the field through elective coursework in topics such as ethical issues in information technology, optical communication systems, and wireless communication systems. IT students choose from thesis and non-thesis tracks. N.C. A&T delivers most online courses asynchronously, but distance learners must meet deadlines for assignments and exams. Both online and on-campus courses last about 16 weeks. Online learners benefit from student services including online registration assistance, Blackboard training, and academic advising. Distance learners can also access career counseling, mental health counseling, and library services. For full admission, applicants need a minimum 3.0 GPA from an accredited institution. N.C. A&T conditionally admits students with lower GPAs. Transfer students may apply up to 12 semester credits of graduate work. North Carolina Agricultural and Technical State University is regionally accredited by the Southern Association of Colleges and Schools Commission on Colleges (SACSCOC). A master's in information technology degree provides students with the advanced knowledge and skills necessary to pursue high-level careers in the IT field. Students also prepare to act as leaders in the field, overseeing other IT personnel. Master's in information technology degrees typically focus on a variety of IT issues, including database management, IT project management, programming, software and hardware engineering, information systems design and architecture, and IT security. In addition, the degree combines theories of management and business administration. With numerous specializations available among many different programs, students may focus their studies on areas like web design, network security, IT project management, IT governance, and more. Online programs offer students flexibility and accessibility. Students arrange their coursework around work or family obligations, with many programs designing their degree for working IT professionals. Depending on the program, students may take classes synchronously or asynchronously. Synchronous classes meet at a set time, often in the evening to accommodate working students, and offer the benefits of a live classroom experience. Asynchronous classes let students complete lectures, projects, and tutorials on their own time. Online IT programs incorporate lectures, homework, and tests through online learning technologies. Graduate students also connect with members of their cohort through discussion boards and group projects. Many students prefer the accessible nature of an online program. Established professionals can attend the top programs in the country without relocating or leaving their jobs. Online students complete their graduate coursework, choose a concentration area, and work with a faculty adviser to earn their degrees. Many continue working while enrolled in a graduate program. For some students, an online program provides a convenient path to career advancement. However, prospective online students must be self-motivated and driven. Admissions advisers can help prospective students decide whether an online program best fits their needs. Earning a master's degree in information technology helps professionals advance their careers and qualify for job titles like computer and information research scientist. With a master's degree, IT professionals pursue opportunities as IT managers, senior computer systems analysts, and systems architects. A graduate degree also meets the qualifications for management-level positions within an IT department. After earning a bachelor's degree, professionals qualify for entry-level positions in IT, but a graduate degree leads to advanced career opportunities. Graduate degrees let IT professionals increase their salary potential. While professionals with a bachelor's degree in IT earn $70,000 a year on average, a master's degree allows them to seek high-paying, supervisory roles. According to Payscale, professionals with a master's degree make $14,000 more a year than those with a bachelor's degree. Many master's-level IT jobs offer even higher salaries, with computer and research scientists earning nearly $115,000 in median annual salary. A master's degree in information technology prepares graduates for many in-demand career paths. With a master's, IT professionals work as IT managers, computer network architects, and database administrators. Some careers, such as computer and information research scientist, require a master's degree, while others like IT manager prefer candidates with a graduate degree. IT professionals work in several industries, including tech, healthcare, government, and business. These career opportunities provide above-average salaries with growth potential. IT Manager: IT managers, also known as computer and information systems managers, oversee IT departments. They plan and direct an organization's information technology strategy and needs, implementing plans to reach the organization's goals. Computer and Information Research Scientist: Computer and information research scientists study complex problems in computing. They also invent and design solutions to computing challenges, including innovating uses for current technology. Computer Network Architect: Computer network architects design networks for organizations, including enterprise-level networks. They can specialize in cloud infrastructure or other emerging technologies. Network architects analyze an organization's goals to create a network that advances its business plan. Database Administrator: Database administrators manage an organization's data and files, including medical records, financial information, or customer records. They maintain the security of the database and prevent unauthorized access. An IT Manager oversees a team or department of IT personnel with the purpose of ensuring the group operates efficiently and meets company goals. Working with network security professionals, web designers, and software engineers, IT managers organize and direct their teams through a combination of IT and administrative expertise. A growing number of colleges and universities offer online master's in information technology programs. Prospective students may feel overwhelmed by the number of choices. Choosing the right IT graduate program can shape your career prospects for decades, so make sure to research each program before submitting an application. Key considerations, including the program cost, the length of the degree, and on-campus requirements, can help certain programs stand out. Prospective students often choose in-state programs, for example, as the most affordable option. However, some public universities offer in-state tuition to all online students. By researching the options, students can find the best fit for their interests and career goals. Program Cost: The cost of a master's degree varies widely. In general, public, in-state universities charge the lowest tuition rates, while private schools charge the highest rates. In addition to tuition, prospective students should research technology fees, the cost of books, and other expenses. Transfer Policies: Students with some graduate credits need to research transfer policies at their potential programs. Some graduate programs let students transfer in credits toward their degree, while others require students to complete their coursework at the degree-granting institution. A generous transfer policy can save money and help you earn a degree faster. School Size and Type: Some students prefer a large university with an expansive cohort of other information technology graduate students. Bigger institutions may also feature wider alumni networks. Other students prefer a smaller class size with more focused attention from their professors. Students can research class size, school size, and the type of institution -- public versus private -- to find a school that fits their needs. Program Length: While most master's programs in IT require 30-36 credits of coursework, program length can vary from 1-3 years. Programs may also require an internship or practicum, which can add to the program's length. Prospective students should research program length, including part-time or accelerated options. On-Campus Requirements: Many online master's in IT programs offer the degree fully online with no on-campus requirements. Some programs, however, require mandatory on-campus experiences, including weekend residency requirements or an orientation. Students considering programs in other states may prefer a program with no on-campus requirements, while online students at local universities may prefer on-campus opportunities. Thesis, Fellowship, and Work Requirements: The program requirements for a master's degree in information technology vary. Programs may include a master's thesis or project at the end of the degree, while others include an internship or other work requirement to gain hands-on experience. Prospective information technology graduate students should always choose an accredited college or university. Accreditation recognizes institutions that follow the best practices in education. Independent accrediting agencies grant accreditation after an extensive evaluation, which considers the school's student learning outcomes, graduation requirements, and faculty qualifications. Accreditation also benefits graduate students. Students at accredited institutions qualify for federal financial aid and typically meet the requirements for professional certifications. Some employers only hire candidates with an accredited degree, meaning accreditation status affects job prospects after graduation. At the institutional level, colleges and universities can hold regional or national accreditation. Generally, regional accreditation evaluates liberal arts and research institutions, while national accreditation reviews technical and vocational schools. Overall, regional accreditation remains the highest standard. Programs can also hold programmatic accreditation from specialized agencies. For example, business schools, teacher preparation programs, and social work programs typically hold programmatic accreditation. In information technology, graduate programs earn accreditation through the institution rather than a programmatic accrediting agency. Prospective students should look for a regionally accredited institution. Both the Department of Education (ED) and the Council for Higher Education Accreditation (CHEA) validate accrediting agencies and maintain lists of regionally accredited institutions. Students can check the ED website or CHEA website to see whether a college or university holds regional accreditation. How Long Does It Take to Get a Master's Degree in Information Technology? Earning a master's degree in information technology usually takes two years for full-time students. Most IT master's programs require 30-36 credits of coursework to complete the degree, which includes advanced courses in the student's concentration area. Programs may offer a part-time option, which often takes three years, or an accelerated pathway to the degree, which can take as little as 15-18 months. These enrollment options can affect the cost of a master's degree, depending on whether the university charges a per-credit rate or a flat fee per term. Each program sets its own graduation requirements, potentially affecting the length of the degree, and includes an internship or a practicum to gain hands-on experience. Graduate students may need to complete a master's thesis or final project at the end of their programs. Advanced Information Technology Many graduate programs begin with a course providing advanced knowledge and skills in IT. The class may cover databases, web and software development, hardware management, and telecommunications. The course introduces graduate students to specialties within IT, preparing students for advanced work within their IT concentration. Systems Analysis Classes on systems analysis train students to design efficient systems and evaluate systems for their effectiveness. Graduate students gain familiarity with system design, functional design, and system requirements while learning common software programs for systems analysis. Most systems analysis courses incorporate projects to measure student learning. Database Design Database design courses prepare students for careers in database management or database architecture. Graduate students learn database design through diagramming tools, data modeling, and functional dependencies. The course also trains graduate students with database management skills, preparing graduates for leadership roles in the field. Network Security Courses on network security teach graduate students to protect networks and computer systems. Students learn about cybersecurity methods, malicious software, and security systems like firewalls. The class may also cover encryption methods and file security. Graduates pursue careers in network security or information assurance. Data Analytics A growing field, data analytics courses prepare students to work as data scientists or in any field of analytics. Students learn about data identification, analyzing data sets, and software for data analysis. Graduate students may also apply programming language skills to solve data analytics problems by designing their own programs. Cisco Certified Internetwork Expert: Cisco offers the CCIE credential with several concentrations, including security, wireless, data center, and service provider. Candidates must take a written exam and a hands-on lab exam to earn the credential. Certified Associate in Project Management: An entry-level certification, CAPM recognizes candidates with at least 23 credits in project management education. Candidates do not need professional experience in project management to take the exam. Certified Information Security Manager: Information security specialists qualify for the exam with a master's in IT and three years of information security work experience. Candidates must pass the CISM examination, and scores remain valid for five years. Certified Information Systems Security Professional: A credential for professionals in information system security, candidates must pass an examination to earn the CISSP designation, which remains valid for three years. Certified in Risk and Information Systems Control: Specialists in risk management qualify for the CRISC credential with at least three years of work experience in two of the four CRISC domains. Candidates must also pass the certification exam. Certified IT Architect Professional: IT architects qualify for the CITA credential depending on their education and experience. At the professional level, candidates demonstrate industry leadership in the skills taxonomy, a primary specialization, and a subspecialization. CompTIA Project+ Certification: A CompTIA credential for professionals with project management skills, the certification tests project management knowledge, management abilities, and project documentation abilities through a 90-minute exam. ITIL Expert Certification: At the expert level, candidates demonstrate advanced skills in information technology infrastructure library management. Candidates complete ITIL modules and demonstrate their knowledge through an examination. Microsoft Certified Solution Developer: Microsoft offers multiple MCSD specializations, including in cloud, mobility, core infrastructure, and data. Credentialled MCSD professionals maintain their certifications by taking the recertification exam every two years. Oracle Certified DBA Professional: Database administrators can earn the OCP certification by passing an SQL exam and database administration exam. Oracle offers multiple levels for its OCP credentials. Project Management Professional: The Project Management Institute offers this certification for candidates with experience as project managers. Candidates pass an examination on project management concepts and must complete continuing education requirements every three years to maintain the credential. Six Sigma Green Belt or Black Belt Certification: Six Sigma recognizes professionals with quality improvement, analytical, and problem-solving skills. Green belts must hold three years of work experience, while black belts must hold three years of experience plus complete a Six Sigma project. IT students and professionals benefit from the resources offered by professional organizations. These organizations host conferences and events with networking opportunities, offer scholarship opportunities and in-demand certifications, and connect job seekers with opportunities through their career centers. Professionals also stay up to date in their field with the publications and technical resources provided by professional organizations. Association of Information Technology Professionals: AITP represents IT professionals and provides research on IT salaries, in-demand professional skills, and technical research. Members rely on AITP for training videos, networking opportunities, IT awards, and local chapters. The association also runs technology events and offers career resources for members. Association for Computing Machinery: ACM connects computing professionals with educators and researchers. Members attend conferences with networking opportunities, join special interest groups, and benefit from the association's research publications. Students can join student chapters, use the association's resources to advance their careers, and win awards at the International Science and Engineering Fair. CompTIA: In addition to granting IT certifications, CompTIA also offers membership opportunities and resources for IT professionals. Members receive resources on the IT industry and attend events to network with other IT professionals. CompTIA also offers trainings, webinars, and podcasts so that IT professionals can stay current in their field. Network Professional Association: An association for IT professionals, NPA publishes articles and interviews about the field. The association's regional chapters host events that offer networking opportunities, and NPA delivers the certified network professional credential. NPA also runs a job board and provides career strategies for job seekers. Association of Software Professionals: IT professionals and students who work in software development or any software-related tech field benefit from the ASP blog, newsletter, and developers' tools. Professionals can submit articles for publication in the newsletter. The association also sells software and hosts discussion groups to solve software problems.